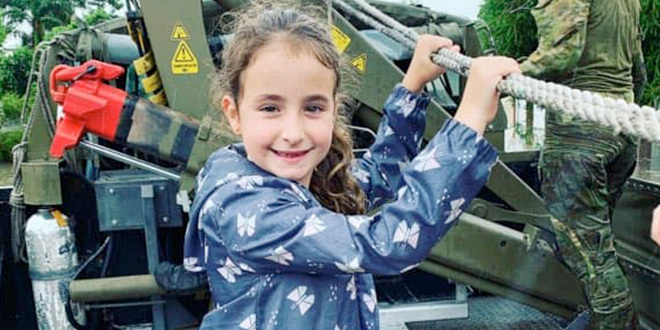 Holding tight: Frankie Davis was rescued by army personnel as waters rushed into the family home. 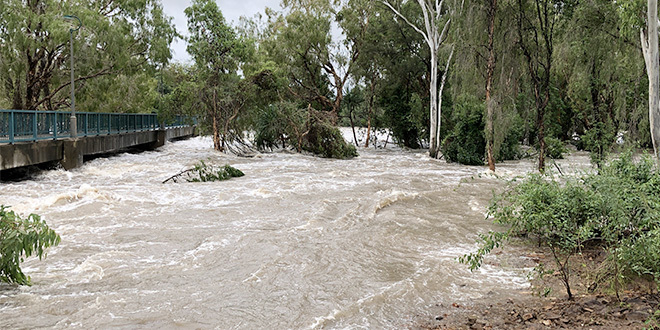 MONSOONAL rains plunged Townsville Diocese into a “once in a century” weather event, and while graziers and farmers in the western region rejoiced after years of drought, thousands of people in Townsville City’s catchment areas evacuated their homes and headed for dry land. 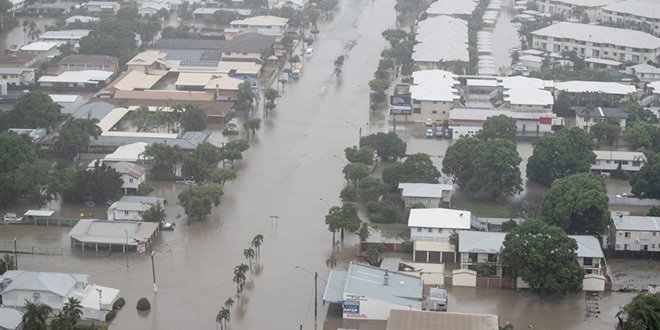 The Bureau of Meteorology reported Townsville received a year’s worth of rainfall in just nine days. BOM extreme weather forecaster Grace Legge said it was a record-breaking rainfall. “This is the highest rainfall event in a 10-day period,” she said. Two men have died in floodwaters that have forced large-scale evacuations across the region. Their bodies were found near a park on Tuesday by rescue workers. Ryan Catholic College primary teacher Corey Davis said his home was inundated last Saturday. “The water went from nothing to a metre in 45 minutes to an hour,” Mr Davis said. Most of the items were replaceable, he said, but not all of them. Mr Davis’ wife was a former basketball player. One piece of memorabilia lost was his wife’s Olympic uniform from the 2008 Olympic Games. “We’re just hoping it hasn’t gotten to our floorboards,” Mr Davis said. Mr Davis, his wife, two daughters and his dog were rescued from the floodwaters, each only able to carry one backpack. “We’ve got about three shirts each,” he said. I’m with my parents in the city now, we’re dry here which is great. Mr Davis praised the defence force personnel who rescued them while patrolling the neighbourhood in their aquatic vehicle. “The defence force has been wonderful,” he said. Former Marian Catholic School, Currajong, principal Karen Pearce said she was safe, and dry, but others had to move out quickly from her neighbourhood. Mrs Pearce asked all Catholics to stop praying for rain over Townsville. “And could they go build an ark,” Mrs Pearce laughed. She said once the waters receded, it would be the mud that took the most work. “It’s something you’ve got to accept, it’s a one in a hundred year flood,” she said. In high spirits, Mrs Pearce said she hoped to be able to get a decent cup of tea soon. 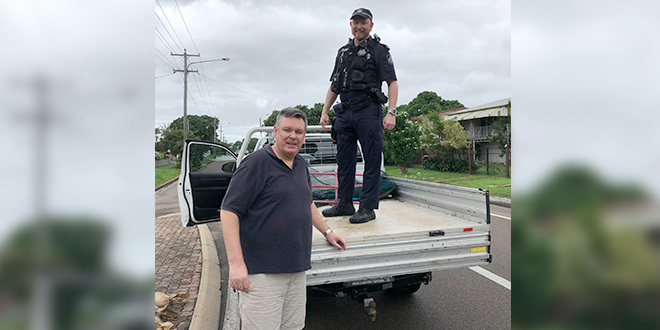 Help on the way: Townsville Bishop Tim Harris with a Townsville City police officer as he evacuated his home on Friday evening. 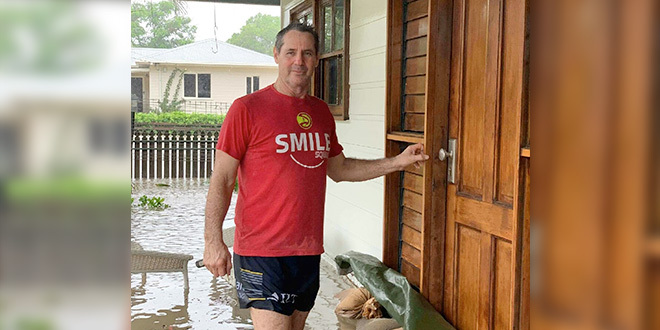 Townsville Bishop Tim Harris said his house at Idalia, a ten-year-old estate that had never seen flooding, had been inundated. He evacuated the house on Friday, February 1 and thanked the police officers who helped him, as his house was overwhelmed the next day. “Having a personal experience of it yourself, you realise the horror of seeing waters rise,” Bishop Harris said. “In your mind, you think is the water going to keep coming? Bishop Harris said one of the journalists covering the flood in Idalia said the area was like Armageddon. “It’s not the end of the world, of course,” he said. “Our faith kicks in and we know that God works best in the mess, and the messiness of our lives. Bishop Harris said it was Mother Nature unleashed, not God unleashing. He said it was now about trying to deal with the reality of the flooding. “The army has been terrific, they’ve been knocking on doors and getting people out in dinghies,” Bishop Harris said. He said people were rallying and the stories of the triumph of the human spirit came out in the toughest of times. Bishop Harris described a story he had heard of an 80-year-old man who had grown “these beautiful flowers that he’d nurtured”. When rescuers came to evacuate him from his home, the man was reluctant to leave his flowers. “This is what the old fellow said: ‘Cut that flower, it’s too beautiful to leave’,” Bishop Harris said. “People in North Queensland are amazing. “People in the north do know these extremes, and they are resilient, no question. “Their kind of view is – we’ve got a tear in our eye but we’ll get over it mate. But the rain wasn’t all bad news. Bishop Harris said he telephoned the mayors of Cloncurry, Hughenden and Richmond. “They’re over the moon,” he said. “They think this is the best thing. Under threat: Lyall Herlihy outside his sandbagged door. Ryan Catholic College secondary teacher Lyall Herlihy said his home was inundated on February 3. “The water is about waist deep in our street,” Mr Herlihy said. “We sandbagged all the entrances, (but) it rose above the sandbags,” he said. “On the up side, the human spirit that’s come out of this has been phenomenal. “In my street alone, the collective group of about six families everyday has been out with sandbags, tarps, cleaners, everything you could possibly imagine. Mr Herlihy said one day he and his neighbours were out working in the floodwaters, cleaning up when a four-wheel-drive pulled up. “So they just helped us load sandbags through the neighbourhood, through our street,” Mr Herlihy said. Mr Herlihy said the men had come from a suburb far away. “And then they said: ‘you know what, I think you need more’. Mr Herlihy said it was a highlight of how good humans could be when times were tough. “Our neighbourhood’s set up a group chat, and all last night, everyone’s saying how’s everyone going, is everyone safe?” Mr Herlihy said. “We had a young single girl who’s mother is in Western Australia, so two of our neighbours moved in with her, a husband and wife, to make sure she was safe and okay. Townsville Catholic Education executive director Jacqui Francis said most other Catholic schools in the Townsville area had escaped any major damage. The only school to receive any major flooding was St Margaret Mary’s College, Hyde Park. 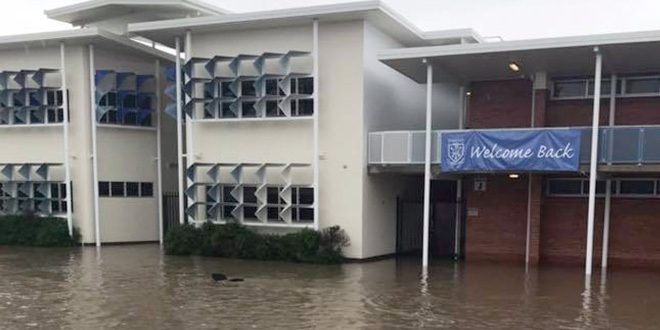 Floods: St Margaret Mary’s College principal Kathy Park said the college had received some damage from the floodwaters on one side of the campus. St Margaret Mary’s College principal Kathy Park said the college had received some damage from the floodwaters on one side of the campus. “We’re alright on this side of the campus, where I’m staying at the moment,” she said. She said a school Facebook post she uploaded showed a photo of water inundating some of the school buildings, which received major community support. “A lot of people in the community are thinking of us,” she said. “The (Facebook) post is getting wonderful comments of people asking when can they come help clean up. She said she appreciated the prayers, support and love of all those who were thinking of them. “You have to live life as best you can, be grateful for what you do have, and spare a thought for those less fortunate,” she said. St Vincent de Paul Society Queensland launched the Vinnies North Queensland Flood Appeal on February 4. Disaster: Houses are inundated with floodwaters in Townsville. Vinnies state president Dennis Innes declared a public disaster appeal, and said financial donations were the best way to provide immediate help. 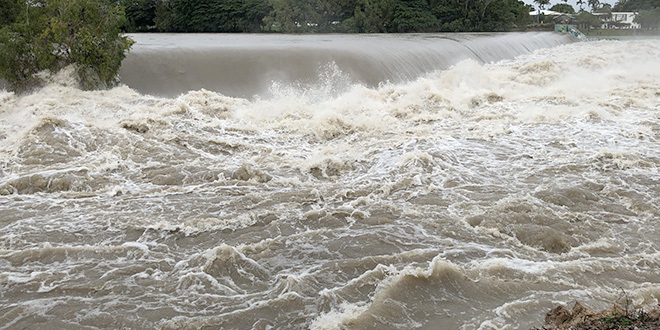 The decision to open the Ross River Dam’s floodgates to their full setting led to further flooding last Monday night. But the decision was not made lightly. Fears about the integrity of the dam wall circulated as dam capacity hit 247 per cent early Monday morning. “Sadly, we received a huge burst of rain at about 1:30 this afternoon for about three hours, that just tipped us over,” she said.